Babies need bonnets, too, so I knit one to go with the BSJ from the last post. I hadn’t knit one of these in ages, and found some language that could be cleared up in the pattern. I’ll get right on that. 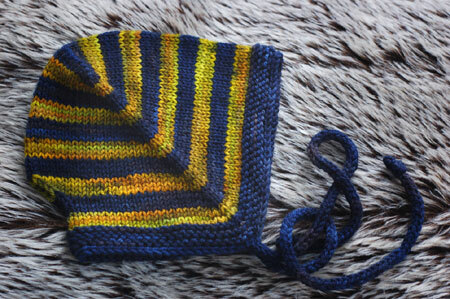 The Top Down Bonnet pattern is now available in Finnish, thanks to the lovely Minna Neuvonen. Get the PDF here. Babies also need rattles, so I got knitting. This was totally fun to knit and it’s an adorable rattle. Knitting with the rattly bit inside, already, was super annoying, but I’d do it again. It’s so cute! I’d also like a couple with weights in the bottom, just for decorations. Can you tell I’ve been raiding my bag of dud skeins and leftovers of hand-dyed yarns? Free yarn, free patterns, just what a person renovating a house needs! Is the yellow yarn the same in each project or are my eyes tricking me? argh what an amazing rattle. and the bonnet too. i have fallen in love with waldorf toys lately. and i think the mushrooms are part of that too. i will soon be knitting sheep and chickens for easter toys for all my wee ones. those are the cutest mushrooms …..ever! 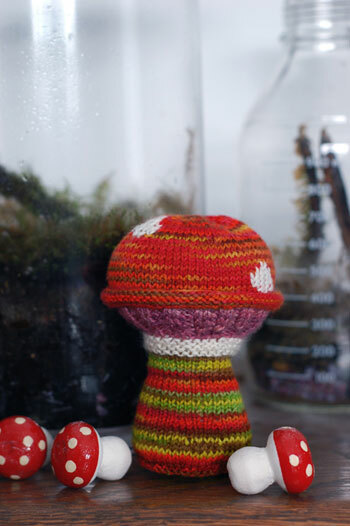 The bonnet is very very cute…but the toadstool is completely and utterly adorable. Love it! The rattle is just too freaking adorable. Someday when I have a wee one I will totally make them several of those. I love the little ‘shroomie! I love the rattle! Wauw, it’s beautiful! So colourful. Wauw! What great use of stitches for effect in the rattle. Ribbing for the ‘gills’ and the little roll of stockinette around the rim of the top. Very clever. What ADORABLE little mushrooms. They are soooo cute!!! great color work. 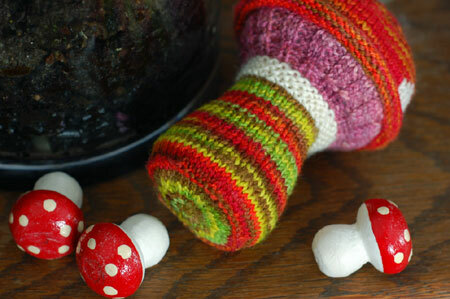 The whimsical rattle makes me smile. Someone I know needs to have another baby so I can knit one up!